“As women gain higher education and better employment opportunities, the number of unmarried people eventually rises, which is common phenomenon in industrialised countries. Many point to women’s entry into the workforce and delayed pregnancy as being key drivers of Malaysia’s falling fertility rate. However, young Malaysians are citing the high cost of living and work commitment as their reason for limiting to one child or not having kids altogether. The Malaysian population is expected to increase to 32.4 million in 2018. The national fertility rate is projected to decline to the lowest level ever recorded since the formation of Malaysia 55 years ago. 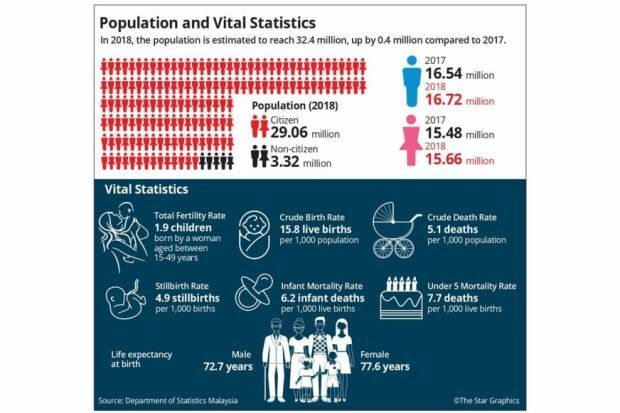 For every 1,000 population, there are only 15.8 live births expected in 2018 compared to 16.1 in 2017, noted Malaysia’s Selected Demo­graphic Indicator 2018. It also stated that the overall fertility rate of Malaysian women aged 15 to 49 is estimated at 1.9 children, which is below the replacement level of 2.1 children compared with an average of 6.0 children per woman in 1963. This is a stark contrast to the world’s most populated country, China, which welcomed 17 million babies in 2017 amid falling birth rates. Concerns of an ageing population are growing in Malaysia, as people are having fewer children. The younger age groups are too small to counterbalance the growing number of older people, said an economics expert. “As more aged exit the labour market and with declining fertility, demand for labour will go up and so will industrial wages. “While Malaysia still has several years before the economic impact of an ageing population becomes apparent, it needs to buckle up. Eventually, we may have to rely on foreign labour or robots or get the elderly to become gainfully employed." “We will have to cope with a fast-­rising population of retired people whose pensions, if any, will have to be paid for by contributions from a shrinking working population.” For example," Prof Xavier said, "at the current rate of retirement of 20,000 to 25,000 civil servants annually, in 10 years the pensions will more than double to RM63bil and the public pension bill is expected to hit RM100bil by 2050. Contributory pensions, increasing the retirement age to 65 and limiting the intake of new recruits could be considered in order to ease the pressure on the public purse. “An increasing amount of medical and health resources will also have to be shunted to care for the ageing population,” said Prof Xavier. China, for example, spends 5% of its gross domestic product (GDP) on healthcare while the United States spends 8.3% of its GDP on healthcare. “We require policy refocus as Malaysia only spends 4.3% of its GDP on healthcare,” said Prof Xavier, adding special programmes for the aged also must be intensified. Government initiatives, such as the Selangor state government’s RM1,000 wedding incentive for couples who marry before 35, could help increase the fertility rate, he said. 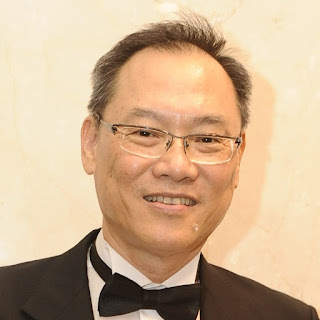 “Similarly, income tax incentive for ordinary child relief, that is now RM2,000, can be increased to RM5,000. The relief for children in higher education can also be increased to RM10,000. “Such incentives will partially help defray the cost of raising children. If the intention is to increase our population, then any tax incentives are sustainable in the long run,” he said.